Tezos raised $232 million in July. They created a new blockchain infrastructure, promising to be more reliable. In October, a class action lawsuit was filed against the founders for securities fraud. Sirin Labs raised $157 million in December. They plan to build a blockchain based smartphone. The Bancor Protocol raised $153 million in June. They allow conversion between tokens, creating greater liquidity. The speed and amounts raised is mind boggling, especially considering that many of these firms are raising funding just on an idea. Recently however, many established and some public companies have, or are considering using ICOs to raise funding. For example, Nostrum is a Spanish food manufacturing and distribution company trading for over 20 years with a 2016 turnover of EURO 25 million. It has over 130 restaurants in Spain and France. At the time of writing, Nostrum is looking to create a Meal Token to be used in different ways to transact within their ecosystem. Kodak recently announced KodakOne, which hope to allow photographers to earn licensing fees as soon as their photos are used through a blockchain platform. An Initial Coin Offering is a form of crowdfunding, centered around crytocurrency (Wikipedia). 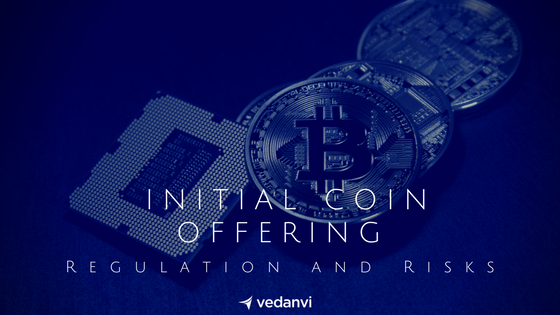 Currently, it’s an unregulated means by which funds are raised for a new cryptocurrency venture (Investopedia). It’s the new way for companies to raise funding without getting entangled in the world of venture capital and private equity gatekeepers. Despite being private companies (or in most cases, not even trading as yet), companies issue their own digital currencies, also known as tokens. These tokens can be traded on a secondary market just like securities. The tokens can either be securities or utility tokens. Security tokens have their value linked to an asset. The asset could be the shares of a company or a share in the future profits or a product. Utility tokens on the other hand confer a right to the investor to access the company’s future products or services. In effect, investors are pre-buying products and services, rather than investing in any form of security. Although costs are rising, ICO may offer a more cost effective way to raise money. The ICO mechanism also offers the opportunity to raise money from across the globe, although increasing regulatory barriers may create obstacles. Unaccredited investors can invest in ICOs, as many jurisdictions do not regulate this form of fundraising as yet. However, many regulators are warning investors of the dangers of ICOs, but apart from China, they have not banned this activity as yet. With cryto exchanges popping up everywhere, theoretically, there is liquidity in this market and investors should be able to sell their tokens. Like reward based crowdfunding, companies can raise funding without giving up equity. In effect, they could pre-sell products or services, which allows for funding of development and other startup costs. Unfortunately, whilst revolutionary, the ICO market has also been wide open to scammers. Scammers have either posed as token issuing companies and have run off with the funds raised, or they have exploited vulnerabilities in the blockchain technology and “stolen” the money. Prodeum is a good example of a scam ICO issuer. The startup set out to disrupt the fruit and vegetable industry through their own issued tokens transacting on the Etherium blockchain. After a small fund raising round, the issuers closed shop and disappeared over a weekend, shutting down their website and all social media channels. Coinckeck is a great example of how firms can fall victim to sophisticated hackers. The firm operates a cryptocurrency exchange, and in January 2018, was punished by the Japanese financial regulator after hackers stole $530 million worth of digital funds from its exchange. Read the full article here. ICO regulation are coming. This market has caught the attention of regulators, who are urged to clamp down, in an attempt to protect investors and the safety of the financial system. Many ICOs will fall into the securities category rather than qualifying as true utility tokens. The implications are that such fund raising will fall within securities and fund raising regulation. The cost of doing such an ICO without regulatory approval could turn out to be very costly. Texas Department of Banking recently issued a cease and desist order to crytocurrency banking platform Arise Bank. According to the regulator, the firm had been promoting and offering banking services without regulatory authorisation. The regulatory order was issued after a raid on the company’s office on Friday 26th of January 2018. The CEO, Jared Rice claimed that the funds raised from their ICO were seized by law enforcement. Read full article here. Even advisers are not immune to regulatory censure. SEC Chairman, Jay Clayton issued a warning against lawyers, accountants and consultants to “act more responsibly and hold themselves to high standards…“. He found it disturbing that lawyers were involved in assisting promoters in structuring offerings of products that have key features of securities offerings, without the promoters being regulated. Regulators have lagged behind the meteoric rise of the cryptocurrency and ICO markets. This is perfectly normal, as it is not the place of regulators to develop the financial services system from a commercial perspective. The pace of growth of the ICO market and the myriad of risks exposing investors, has however caught the attention of the regulators. Some are becoming very assertive while others are taking a more pragmatic approach. Regulators are adopting one of three approaches. 1) A total ban on ICO’s, 2) Welcoming ICO issuers with open arms, or 3) Adopting a more cautious approach. China and South Korea have outright banned ICO’s in their entirety. The Chinese regulator is also aggressively shutting down cryptocurrency exchanges. Traditional offshore financial centers such as Gibraltar, Switzerland, Isle of Man and Cayman Islands are actively welcoming ICO issuers, and creating a friendly environment for them to raise capital in. Developed economies such as UK, USA, EU, and Canada are taking a more cautious approach. Many have come out to warn investors of the risks of ICO’s. They have also made it clear that security based ICOs fall within the ambit of the extensive and well developed securities regulation. The onus is on the issuer to ensure regulatory compliance. Failure to do so can be catastrophic, with certainty that issuers will be confronted with a cease and desist order, shutting their business down and opening the founders to criminal and civil proceedings. Wulf Kaal has carried out an indepth analysis of the regulatory responses to ICOs in 25 jurisdictions around the world. Click here to access his report. Its confusing when regulators come out and make statements such as “Most ICOs are not regulated by the FCA…“. This is statement made by the UK’s Financial Conduct Authority in a message aimed at warning investors of the potential risks of an ICO. They do go onto to clarify that whether ICOs fall within regulatory boundaries is to be decided on a case by case basis. To reiterate, the onus is on the issuer to ensure that the ICO falls outside regulation or to ensure full compliance. Unregulated: A genuine utility token may escape regulation. Like reward based crowdfunding, a utility token is used to pre-sell units of goods and services. The token could be “burnt” or destroyed once the service or product is delivered. Tokens have a value which could rise or fall. They could also be traded on a cryptocurrency exchange. Care should be exercised however, as the regulatory position will be determined by how the token economy is structured. A token may represent electronic money and subject to E Money regulation. It could also be considered a security. Initial Public Offering: A token can represent a share in the business, in which case, securities regulation apply. In the UK, the Prospectus Directive will apply, as is the case for any equity funding. Any intermediaries involved will need to be regulated to be able to facilitate the investment on behalf of investors. In the US, any token that does not pass the Howey test, will be considered a security and fall under the 1934 Security Exchange Act. Crowdfunding: When facilitating an ICO, rather than issuing a token, crowdfunding regulation will apply. In the UK, non accredited investors are limited to only investing 10% of their portfolio in such investments. Arranging Deals in Investment: Whilst crowdfunding is open to non accredited investors, arranging a deal in investment for an investor outside this regulation will be restricted to accredit investors only. Collective Investment Schemes: Some ICO’s raise funding in order to make onward investments into other assets. This could be a portfolio of other cryptocurrencies, financial instruments or pyhsical assets such as properties. Regulation pertaining to managing a fund will be applicable. The fund manager as well as the fund itself may need to be regulated. Emoney Regulation: Certain tokens are a representation of fiat money. Tokenisation helps to facilitate transactions within an ecosystem. For example, a peer to peer lender converts loan parts into tokens. The tokens represent a fiat currency value of the loan part itself. For example, each loan part could be valued at £10 and therefore a token is worth £10. Tokenisation allows for cross border trading of loans. In this example, the token stores the value of a loan part and allows for smart contracts and cross border settlement. Investors would get paid back in fiat currency at the end of the loan. Financial Promotion Regulation: To protect especially retail investors, regulators set out stringent requirements for promoting investments. These regulation apply regardless of whether the firm is required to be regulated or not. For example, even if ICO’s are unregulated for whatever reason, they may still be subject to financial promotion regulation. Financial promotions need to be fair, clear and not misleading and present a balanced picture, highlighting both returns as well as risks. Most ICO marketing I have seen, rarely seem to refer to risks. Tax Laws: Capital gains, dividends and income may be subject to tax laws. VAT may also be applicable for services provided, for example by cryptocurrency exchanges, to their investors. ICO firms may be required to with hold tax and pay it over to the tax authorities. In the USA, crypto-to- crypto-transactions as well as crypto-to-fiat-transactions are taxed. The UK position is less clear at this stage. Majority of ICOs are likely to be caught by securities regulation. Seek professional advice before embarking on an ICO. Failing to do so could be a very costly affair, not only exposing you to financial risk, but also personal risk. If found to be breaking the law, founders could not only face prosecution, but also be barred from ever working in financial services. Judging by some of the scams presented earlier in this article, the ICO market is fraught with risks. Not only do investors face risks, but the ICO issuers and advisers are also exposed to significant risks. Like an IPO (Initial Public Offering), the white paper should clearly identify risks faced not only by the issuer but also the investors. A well thought out and comprehensive risk management and mitigation strategy should be presented to investors. Moreover, stakeholders must be given assurance that this strategy is actually going to be implemented by a competent and capable team. Risks to Investors: ICO promoters often highlight the returns investors can expect, but rarely do they point out the risks that investors are exposed to. A careful assessment of risks that investors face, must not only be highlighted, but the issuers must also present a plausible plan on how they plan to mitigate such risks. For example, risk of dilution, or drop in value of the tokens. Cyber Security Risk: When stored in the cloud, digital assets are open to hacking. Coincheck lost $500 million worth of investor assets to hackers. In addition to compensating investors, they also face regulatory censure for poor systems and controls around platform security. Strategy Risk: Firms carrying out ICO’s are breaking new ground, pursuing strategies that may never have existed before. They are also building on blockchain technology, which is still in proof of concept phase. Issuers need to convince investors and other stakeholders that they have a strategy that has market potential to scale. Their risk assessment need to highlight how the firm will pivot if the initial strategy fails. Competition is rife in this space, because every new player see the big prize up for the taking. Firms need to demonstrate that they can maintain their competitive advantage. Execution Risk: Anyone can have a great idea or strategy, however success lies in being able to flawlessly execute the strategy. In the case of a utility token, will the firm be able to produce the product as planned or deliver the service as promised? How will the firm deliver the strategy so that security tokens continue to generate high yields that was originally promised by the founders during their ICO pitch. Failing to deliver may lead to class action suit as investors may feel like they had been misrepresented. Market Traction: Most startups fail and there is no exception with innovative blockchain based firms. Failing to get market traction is often the biggest cause of failure. Firms don’t win over customers quickly and therefore fail to generate revenues needed to build a sustainable business. Going out of business would mean that investors lose everything. Firms need to provide assurance to their investors and other stakeholders that they have what it takes to gain market traction. People Risk – war on talent: Any blockchain based business model will acutely feel the impact of a war on talent. There is only a small developer community who are actually capable of developing workable and commercial solutions. There is a high demand on this small pool. Even if salaries are hugely inflated, supply is going to be constraint, until the formal education system produce blockchain developers and strategists en masse. Whilst solutions will get off the ground with one or two developers, the firm will struggle to scale without the required level of human resources. Firms will have to convince investors and other stakeholders that they have connections to the right networks to be able to tap into talented pools of professional and outsourced service providers, or that they have the right connections to be able to hire the best blockchain experts. Capital Adequacy Risk: Traditional financial services institutions are required to hold capital buffers to withstand shocks. Similarly, ICO firms must demonstrate that they will set aside and prudently manage reserves. Lack of cash flow is one of the biggest causes of start up failures. Crypto currency exchanges should also be mandated to maintain such reserves, because platform failure could be disastrous for investors, who may be unable to access their investments. Banks and other financial services institutions have to develop a well thought out “living will”, setting out steps that the firm will take to protect investors in the case of their demise. Exchanges would benefit from drawing up such plans, winning investor confidence. Given how the year has started, 2018 promises to be a year where regulators crack down. More positively, they will provide much needed regulatory certainty. As they roll out their regulatory frameworks, risk management will be prioritised to ensure that investors and the financial system are protected. Jay – I take the view that a crypto is an instrument that crates or acknowledges indebtedness, in much the same way that a banknote is. However, banknotes are specifically excluded form regulation in the UK, for obvious commercial reasons., No exclusion exists for cryptos. Sooner or later, this point will be litigated, e.g. when one of these offers fails. If I am correct, then every ICO is an offering of debt securities that needs a compliant prospectus (unless it is too small in size to matter etc.). All materials (aside from the prospectus) are therefore financial promotions, and their handling by unregulated persons to approach the general public is unlawful. Daniel. Thanks for your comments. As you are well aware, the onus is on the firm to satisfy themselves that they either need to be regulated (in which they need to be compliant) or that they are outside the regulatory net. Technically, a genuine utility token could fall outside the regulatory net. For example, like Rewards Based Crowdfunding, the token is like a ticket sold in advance of the service or product being offered. The token could be used in future in exchange for that service or product. Anything else, as you rightly point out, is likely to be classified as a debt or equity security and therefore subject to regulation. The issue and parties facilitating such transaction both will need to consider whether they are carrying out a regulated activity.